Georg Betz was born July 1859 in the Volga German colony of Messer, Russia. George married Anna Katharina Bauer in 1878. Anna Katharina was born on December 28, 1858 in the colony of Norka, Russia. Soon after their marriage, Georg and Anna Katharina immigrated to the United States, arriving at New York's Castle Garden on June 12, 1878. ​Georg's brother, Peter, had arrived in Bison, Marion, Kansas in 1875. 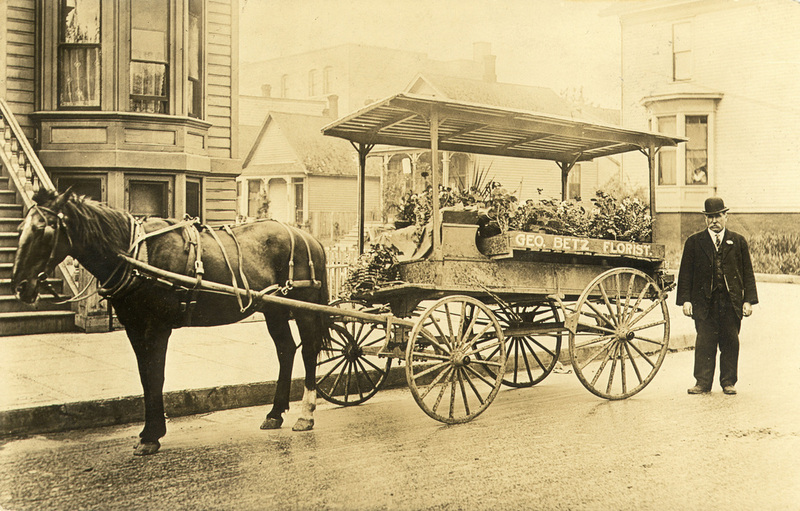 George Betz and his flower cart. Photograph courtesy of Harriet Betz. Georg (now George) and and Anna Katharina (now Anna) initially settled in Marion county, Kansas, Their first child, Karl, was born in November and lived only a few days. The following year they moved to Hastings, Nebraska where one of Anna's sisters lived nearby. George was a gregarious person and not fond of farming. By late 1882, they may have received favorable reports about life in Portland from the earliest settlers who had moved there in 18821/82. George and Anna arrived in Portland in March of 1883. It is likely that they traveled with Anna's sister, Sophia and her husband Johannes Brill. In 1885 and 1886, City Directories show that the Betz family was living on the south side of San Antonio (later Sellwood Street) between Williams Avenue and Rodney. Family legend recalls that George initially worked as a landscaper and soon learned to grow his own flower stock. In 1886, George established a florist business at 292 Sellwood Street (now Graham Avenue). A son, Charles, was born on March 18, 1886 and two more sons, Joseph and George W. would join the family. ​The 1895 Portland City Directory shows that George opened a second store at the foot of Morrison Street in downtown Portland. This shop was likely part of an early Farmer's Market that would evolve into the Yamhill Public Market (also known as the Carroll Public Market). George would transport flowers downtown by wagon, selling on the way to town and back. George Betz likely crossed the Willamette River via the first Steel Bridge. 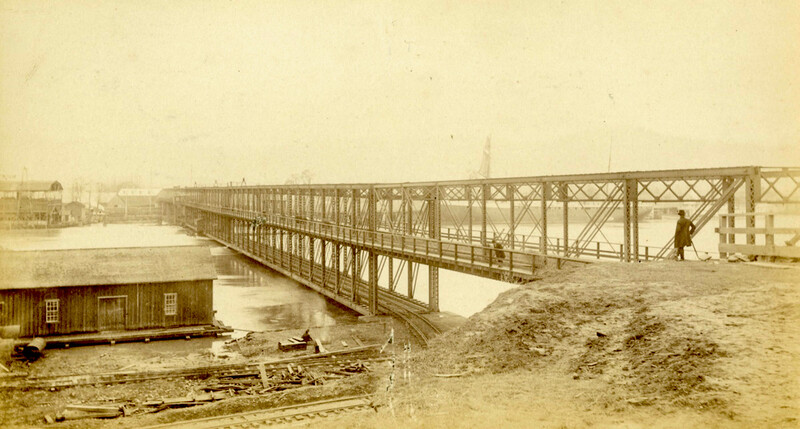 This photo from the time of the bridge opening in 1890 shows the east end, which was at the foot of Holladay street. Source: City of Portland Archives. After twenty years at the Sellwood Street location, George moved to 697 Williams Avenue where he built a greenhouse and a florist shop that was attached to the residence. In 1907 he purchased eight acres of the Jennings Lodge tract in Clackamas County, three miles from Oregon City. There he built an additional residence and more greenhouses. By 1910 he had 40,000 square feet under glass and was one of the best-known florists in Portland. His business became known as George Betz and Sons, Florists. The Betz family had retail outlets at 349 ½ Morrison Street (now 727 SW Morrison) and 697 Williams Avenue (now 3300 N. Williams Avenue). George established flower displays in local stores such as Piggly Wiggly and Kress. He would rent empty storefronts for a few weeks and enlist his grandchildren to sell flowers on street corners just before the holiday. George marketed himself as "Portland's Pioneer Florist". About 1925 Charles moved to 94th and Clinton where he built greenhouses and specialized in raising Easter lilies. George and Anna became Seventh-day Adventists sometime after arrival in the United States. It is likely that they were members of the Albina Seventh-day Adventist Church founded by Friederich Jörg. George was a very gregarious person and a snappy dresser. He always wore a red carnation. His wife, Anna, and daughter, Sarah, were also very much involved in the business. Everyone worked in the greenhouses even the grandchildren. My dad remembers standing on a bench to weed the flower beds at four years of age. My uncle Jack used to skip out to play baseball with his friends knowing he faced a whipping when he got home. Anna and Sarah and the wives of the Betz brothers often cooked for the hired help. Holidays were especially busy times for the Betz clan. Most of the family income was made at Easter, Christmas, and Decoration Day (Memorial Day). Extra high school and college age young people were hired. After 1925 Charles Betz imported bulbs from Japan and learned to make Easter lilies bloom at just the right time for Easter. He persuaded stores like Safeway and Kress to carry his lilies. Empty storefronts around town were rented temporarily and family and friends were pressed into service for the busy holiday. My dad, Charles Jr. and his brother Jack sold flowers on the street corners, a job they both hated with a passion. To this day my dad has a hard time passing a street corner flower stand without stopping to buy." ​George Betz, a florist here since 1885, with stores in various locations at different times, has opened a place in the Cascade Market on Yamhill Street, between Third and Fourth streets. He says business has been good with him and is getting better all the time. He has an attractive looking place and will handle all kinds of bedding stock, as well as cut flowers and potted plants. From Florists’ Review Vol. 43. March 27, 1919. 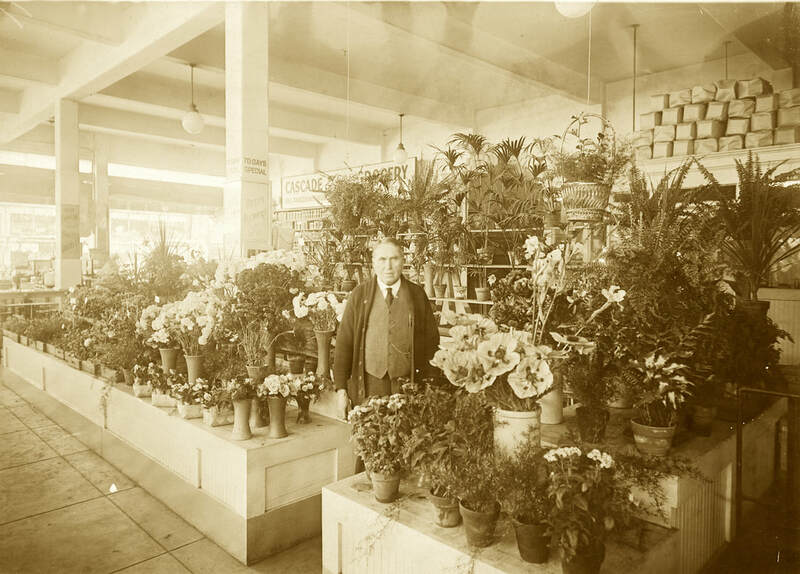 Photograph of George Betz in his florist Shop located in the Yamhill Market (also known as the Carroll Market) in downtown Portland. Courtesy of Linda Hansen. Anna Katharina died on July 12, 1925 in Portland. George died on September 29, 1935 in Portland.